Kefir: make your own and reap the rewards! I have been making kefir for the last four years. Kefir is a fermented drink, most often made with cows milk. Its similar to yogurt, but even better for you: 1) because of the broader range of beneficial bacteria it contains 2) and the greater ability of those bacteria to colonise your gut. 3) no need to heat the milk, as you do with yogurt, so better if using raw milk. 4) more beneficial bacteria in kefir than in sauerkraut. 5) bacteria adhere so you have a greater chance to improve your digestion, your intolerances, and your overall health. Kefir was my first entry into the wonderful world of fermented home-made foods. I knew I wanted to do it but didn’t know how to get my grains to start. Unlike yogurt, kefir is made with small cauliflower like balls made up yeasts and bacteria, surviving and feeding off the nutrients from dairy milk. Between batches of kefir you need to keep the grains alive with some milk in a slower environment such as the fridge. 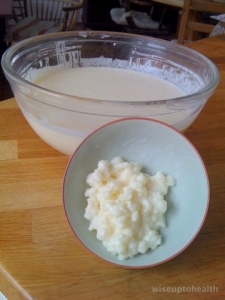 Different kefir grains can be found to feed off sweetened water, or coconut milk, but the process of keeping them ‘happy’ and well fed is more tenuous, and less successful long-term. Getting my grains I could have searched for grains on line, but this time they fell into my lap instead! I got chatting to a personal trainer from my gym, who I vaguely recognised, because I was curious about his shoes with separate toes. He was cycling on his way back from the Farmer's Market, with raw milk for making kefir. I jumped in the air, nearly, and made him promise to give me some grains, which is no big deal as they increase over time. Traditional knowledge handed down As usual when it comes to fermented foods, those who know most about them come from other cultures than the UK. He was Hungarian, and in his childhood, behind 'the iron curtain', fermented foods such as kefir and sauerkraut had supplied the population with nutrition in winter, when non local foods such as oranges were not imported. The following week he very kindly gave me a jar of raw milk and kefir grains for my first experiment in making kefir. That batch has kept going ever since, with an addition in the form of a partial swop of someone else's grains. His were different to mine. More strings of colourless mucous! Apparently they pick up from your environment and no two sets of grains are alike in the strains that they develop. I love that non standardised outcome, don't you? Kefir experts, by the way, inform us that this mucous is good! Worried about dairy intolerance? Don't be ...... well try it and see! 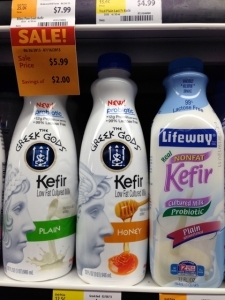 If you are lactose intolerant kefir sorts that out by pre-digesting the lactose. A very small proportion of people intolerant of cows milk (pasteurised and raw) cannot tolerate kefir, but it is rare. So you may have heard kefir mentioned quite a bit over the last few years, as more and more people, including those with allergies and food intolerances, turn to kefir to heal their gut and improve their health. What kind of milk? 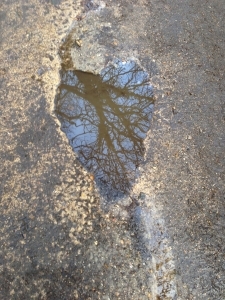 If you can get raw unpasteurised milk from a farmer, or farmers’ market, then its preferable to use this. See previous blog on raw milk. In the UK raw goats milk is available to buy in shops, but the fat content is less in goats milk, and that is what the kefir grains flourish on. If you have to use pasteurised milk make sure it is full-fat, organic, non-homogenised and from grass-fed cows. If you feed kefir grains on low fat milk they slowly starve to death. And skimmed milk is still considered ‘good’ for humans?! Homogenised milk is definitely something to avoid, because the smaller fat particles, produced under high pressure, become denatured, and undigested particles of fat allow Xanthine oxidase to enter the bloodstream and damage the artery cell walls. Most of the milk consumed in the US is homogenised. Homogenisation extends shelf life, but not it seems ours. Interestingly its not disastrous if you can’t get raw milk. This is because the kefir grains work on the denatured pasteurised milk and turn it back (almost) to its original state, with enzymes and bacteria in prolific numbers. However, its worth reiterating: don't use homogenised milk. So maybe in the US that does mean the luck of the draw when it comes to where you live and what the law is regarding raw milk. 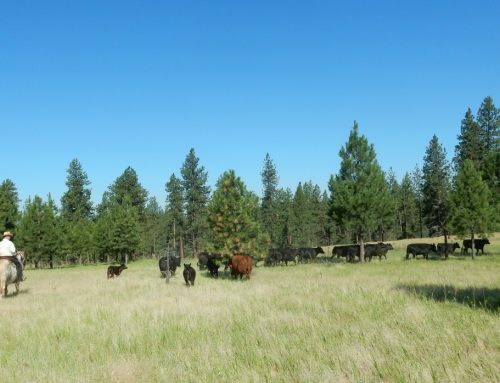 These US kefirs go in for a bit of pulling the wool over our eyes (mixed messages) don't you think? Thumbs up for Greek (delicious and full fat), thumbs down for low fat and no fat. But many will drink this, unwittingly, and give themselves a pat on the back: low fat AND healthy because its kefir! Sadly. Generally many shop bought kefirs are good, as long as the milk is not homogenised. For making your own, here in the UK Waitrose organic milk, as well as Duchy Originals, is non-homogenised. The UK brand Gold Top is solely from Jersey and Guernsey cows, and is non-homogenised, however, it is not organic. Tesco, Ocado and the Cooperative Society sell Gold Top. Also Bowland Fresh is non-homogenised (Booths in the North West); and English Select Farm. 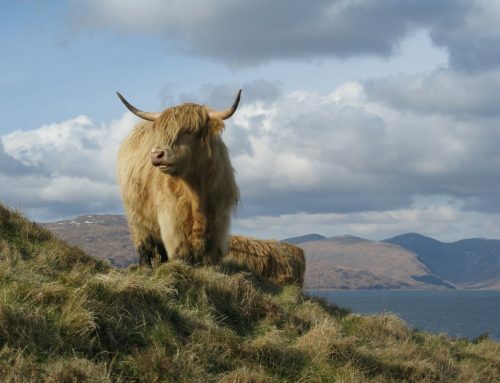 The Natural Food Finder is an excellent website for finding raw milk supplies in the UK. Kefir is alive: whey separated at the bottom, and kefir getting active at the top! Sourcing kefir grains: But before deciding on what kind of milk, you need to plan ahead and work out where you are going to get your grains from. You can buy them online if you don’t have a friend with an excess supply to pass on. You only need a tablespoon. This is a good UK source, made with organic pasteurized milk. Transitioning these grains to raw milk, from pasteurized, should be done gradually according to Cultures for Health Don’t get persuaded into buying powdered kefir starter packs, which are for up to six uses only. What’s the point when you can get the grains, which will grow and be available indefinitely, depending how you look after them? If bloggers only talk about using starter packs, perhaps its because they are earning commission, which is fine, but only if it does not skew the advice that they give. You don’t get the full spectrum of beneficial bacteria with a starter powder. Equipment: you will need: a plastic sieve, a wooden spoon, a large glass container to strain the kefir into, a glass jar with a lid to hold the milk and grains whilst they ferment, a muslin cloth. Avoid using metal containers or spoons. A muslin cloth placed over the jar, secured with a rubber band, allows the air from fermentation to escape. If you do close the lid, make sure you open it now and again to prevent build up of gases, especially if the milk comes near the top of the container. The photo above is an example of how not to do it i.e. not enough space from between the top of the kefir and the lid of the jar, whilst the bacteria get active and do their job of magically transforming the milk. Ready to go: if you want the kefir to start fermenting straight away you will need to gently heat the milk to blood temperature, or leave the milk out of the fridge until it reaches 70-78 degrees F. In colder seasons, leave the milk and grains on the countertop near a source of heat, or put in the airing cupboard. However, too hot and it will not thicken. Don’t forget the kefir entirely while the grains get to work. Give it an occasional stir to make sure all the grains have access to the nourishment from the milk. Leaving raw milk outside the fridge is not some scary act of folly! Pasteurised milk goes off. Raw milk has enough beneficial bacteria to kill off the bad, and over time turns into sour milk great for cooking with, or kefir with the grains. You can make your own cream cheese this way too. How long does it take? There is never a set time, as so much depends on the temperature, and the amount of grains to milk. In winter I place the milk and grains in a close-fitting insulated bag, and this seems to work. When the whey separates from the curd, the kefir is ready, in anything from 12 to 48 hours. Once you have separated out the grains from the kefir, by gently separating the kefir from the grains through a plastic sieve, you can increase the nutrition from the grains by adding more milk straight away, and going for another batch. Once you have the kefir milk you can drink it straight away, or place in the fridge. If in the summer months the kefir is a bit runny, by placing it in the fridge it usually thickens up. Leaving the kefir with the grains for more than 48 hours could deprive the grains of food, and is not recommended, without starting the process again with more milk. 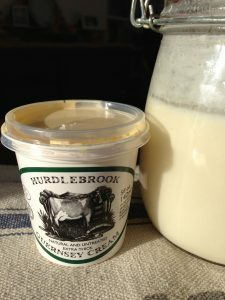 If I am feeling in the mood, and have some, I will add delicious raw cream from Hurdlebrook farm to the kefir fermenting process. I place the grains in a jam jar with some milk to put in the fridge inbetween making batches of kefir. The grains go to sleep in the low fridge temperature, though not entirely. 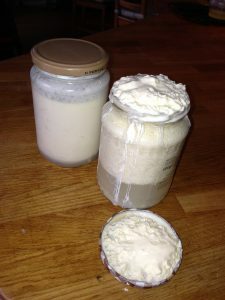 Batch size Kefir bloggers recommend making small and frequent batches, rather than all the time putting kefir in the fridge between batches. However, I use a litre of milk for each batch, and it seems to work. Going away, you can leave the grains in the fridge in milk for up to ten days. If away for longer, freeze the grains. The grains will take up to a month to come back to life after freezing. Before I knew this I made kefir from defrosted grains from the freezer. How do I drink my kefir? 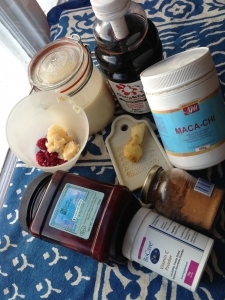 I make a raspberry smoothie (more details later) with it in the morning, with cherry juice, maca powder, cinnamon and nutmeg powder, ginger juice, coconut oil, fermented cod liver oil, a raw egg yolk, Vit C powder, and some powdered seaweed. That takes me through to lunch time, without getting hungry. 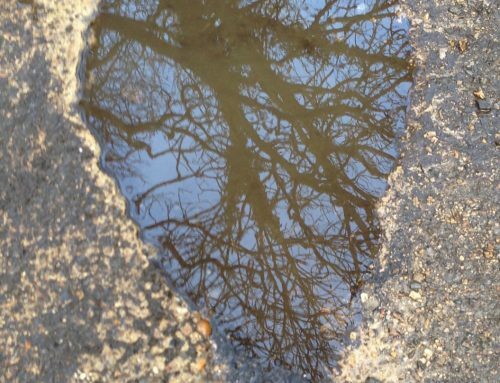 How has my health changed? Hugely. Recently I needed antibiotics after a hefty dental session, and they did did not change my digestion, by causing the usual flatulence or diarrhoea. The kefir got busy in other words! Sauerkraut helped with this outcome too, of course. I no longer get dental plaque, and that I wholly attribute to fermented foods, and the action of the beneficial bacteria in my mouth. A word of warning here: if you don’t start slowly, with a very small amount of kefir, and work up from one teaspoon a day gradually, your reactions may cause you to think you are reacting to the dairy, when in fact it could be your body adjusting to the increased beneficial bacterial load, and die-off symptoms it causes. I was fine without doing this, but its best to err on the side of caution. So take the plunge, just do it, and cut down on that packaging from the supermarket, support your local farmer, and give yourself a delicious and healthy treat. By the way, June and September are the best months for cows milk, in terms of the sun on the grass and the quality of the milk, in the northern hemisphere that is! Finally please contact me with feedback on your kefir making stories and experiences. How do your children take to it? Has it made a difference to your health? How is the rhythm of making it impacting on your time? I don't find it gets in the way at all. Lets spread this knowledge around, to neighbours and friends. After all, as Sandor Katz said, The Revolution Will Not Be Microwaved! I'll be thinking of this on March 31st when I attend the Food Standards Agency public meeting to examine the pros and cons of raw milk in the UK. My choice to stay healthy is being threatened. 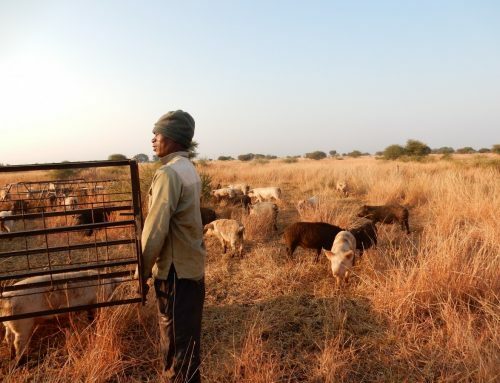 Join me, wherever you are, in standing up for truth, the local, and the small farmer who is fighting a losing battle in this fast changing world.